Balancing transport and installation logistics with the requirement for bigger rotors. Vestas succeeded in retaining the 1.8-metre blade-root diameter of its V110-2.0MW turbine for the longer blades of its V116 and V120 models, despite the inevitably higher blade-root loading. This remarkable blade design also enabled unchanged hub outer dimensions while strengthening internals, which meant no changes had to be made to road, rail and sea-transportation arrangements in the US, India and China. Multiple technical challenges were tackled in different, complementary ways. One measure was switching from four-point ball-type pitch bearings to three-roller type units, offering higher load capacity and elongated bearing life for the given outer dimensions. The latter is essential due to the use of "classic" independent pitch control, which involves continuously re-adjusting individual blade pitch angles during each rotation, and inevitably higher pitch-action frequency. In parallel, the hydraulic pitch system capacity was increased to enhance control capabilities of the longer blades. 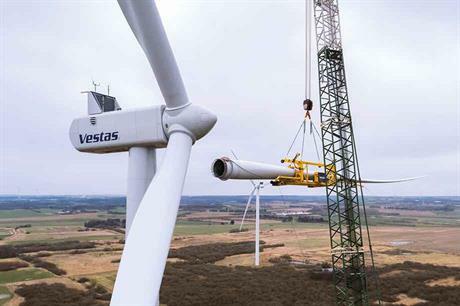 Vestas opted for a slender structural-shell design, incorporating carbon, and a central single-web structure (internal reinforcement beam). The aerofoils are more "rounded" for higher structural stability without compromising aerodynamic performance. The result is a blade mass increment of only 500-600kg for the V120 blade against the V110’s, with a parallel focus on minimising manufacturing costs.